There is nothing the man likes better than challenging the conventional wisdom of the progressive elites and watching how they react. Trump's US, a weakened destiny for argentinian goods and travellers. Foto:AFP. Donald Trump has done it again. There is nothing the man likes better than challenging the conventional wisdom of the progressive elites he thinks are responsible for many of the world’s ills and then watching to see how they react. By announcing that, as far as he is concerned, Jerusalem is Israel’s capital and should be treated as such, the US president managed to enrage people who think they are entitled to speak on behalf of the “international community” and most officials of their favourite institution, the United Nations. He also gave Western European leaders and the Pope a fit of the vapours; despite everything that has happened in recent years, they still seem convinced that if they try hard enough they will succeed in persuading Muslims that Islam really is as peaceful as its apologists insist. In their way, they all agree with those irate Arab, Iranian and Turkish spokesmen who say Trump has just declared war on a billion-and-a-half Muslims. For Europeans, that is a disquieting thought. If some irreverent cartoons once published in an obscure Danish newspaper were enough to provoke riots, they find it easy to imagine what could happen now that Trump has at long last ratified the Jerusalem Embassy Act of 1995, when an overwhelming majority of US legislators – 93 to 5 in the Senate, 374 to 37 in the House – voted in favour of moving it from Tel Aviv. One president after another put off the move for “national-security” reasons, but if what has happened since 1995 is anything to go by, such efforts to placate the Muslim street did not earn their country much respect. 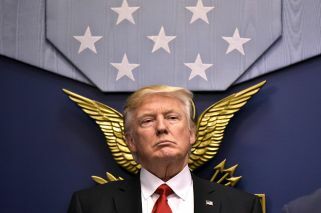 By defying the international establishment, Trump has ensured that all the unpleasant things which are bound to happen in North Africa, the Middle East, Pakistan, and further afield in the coming years will be blamed squarely on his crassness. For years now, most Western politicians, diplomats, academics and journalists have taken it for granted that, were it not for the dispute between Israel and her neighbours, the peoples of the region would beat their swords into ploughshares and live happily together in peace. All of which is nonsense, but attributing what is going on to Israeli intransigence gives them an excuse to avoid taking a hard look at a large region of the world they assume has been badly treated by previous generations of Europeans and North Americans. If they did, they would understand that the murderous turmoil that is tearing apart dozens of countries stretching from the Atlantic Ocean to the South China Sea has far less to do with Israel than with the justified feeling among Islamists that they have the once overbearing West on the run. By bending over backwards in a vain attempt to appease such individuals, of which there are many, Western leaders – products of what some anthropologists call a “guilt culture” – only encourage people whose values tend to be very different to become increasingly aggressive. Islamists and their allies hate Israel not for its alleged crimes, which are mild indeed in comparison with the ones that are committed daily in all neighbouring countries, but because – as a glance at the Koran makes unpleasantly clear – ever since its inception Islam has had it in for the Jews. That is why Turkey’s Recep Erdogan and many others say that all Muslims, not just the ones who are directly affected, will find Trump’s flagrant support of the “Zionist entity” infuriating and as a result could go on a rampage. Both Hamas and, in a slightly milder fashion, the Palestinian Authority led by Mahmoud Abbas, who is currently in the 13th year of his four-year term, assume that the only acceptable “solution” would be the physical elimination of the Jewish State. For them, its mere presence in an area once ruled by Muslims is an intolerable affront; the “two-state solution,” one of which would have to be as Judenrein as Saudi Arabia, that has kept Western diplomats busy for decades, is just a ploy designed to persuade outsiders that Israel’s mortal enemies are reasonable people. So far, the ploy has worked extremely well. Western taxpayers have invested an enormous amount of money in subsidising a growing number of largely hereditary Palestinian refugees. It is often overlooked that just as many Jews were forced to flee from Arab countries and seek refuge in Israel, where they were well received, as there were Muslims who felt they had to go in the opposite direction, and that, unfortunate as population exchanges undoubtedly are, on occasions, as was the case in the early 1920s when Greeks, that is, Christians, and Muslim-Turks realised they had better part company, they are the least bad alternative. Had the Arabs recognised Israel back in 1947, their many countries would have absorbed them without much difficulty, as did the Germans when many millions of compatriots were forced out of lands in Eastern and Central Europe their ancestors had lived in for centuries, but they decided it would be better to keep them waiting on the frontier in the hope that one day they would be able to return in triumph. That day has yet to arrive. The Jews have not been driven into the sea after being subjected to a genocidal bloodbath, as Arab leaders promised. Instead, their country has become a formidable military power. Perhaps it would be unfair to attribute Muslim claims that Jerusalem is every bit as holy to them as it is to Jews to nothing more than reports of Mohammed’s “night journey” on a winged horse called al-Buraq that took him from Mecca to the Dome of the Rock and back in a couple of hours, but for fear of annoying the pious few Westerners care to delve into the matter. For most, Muslims – who regularly converted temples of other creeds, among them Hagia Sophia in Constantinople, into imposing mosques in order to symbolise their own supremacy – have as much right as Jews and Christians to treat Jerusalem as a holy place, hence the uproar caused by Trump’s refusal to let himself be intimidated by threats or moved by the pleas of people who apparently think that somehow or other what they call the “peace process” can be made to work.